IMAX China Holding, Inc. today announced that DirectorTsui Hark’s Detective Dee: The Four Heavenly Kings will be digitally remastered into the IMAX® 3D format and released in IMAX® theatres across China on July 27. The film is produced and distributed by Huayi Brothers Pictures and CKF Pictures. This is the second time that the highly popular Detective Dee franchise will be released on IMAX, following Young Detective Dee: Rise of the Sea Dragon in 2013. A talent shout-out video was released in the meantime to encourage audience to enjoy this film in IMAX 3D. 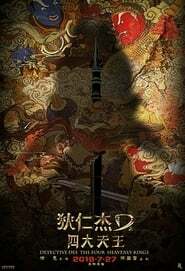 Directed by Tsui Hark and written by Chen Kuo-Fu, Detective Dee: The Four Heavenly Kings features the return of leading roles from the last episode, including Mark Chao, Feng Shaofeng, Lin Gengxin and Carina Lau, with the addition of new faces such as Ethan Juan and Ma Sichun. The story of the new film started after Dee successfully solved the ‘Sea Dragon King’ case, when he gained the authority to manage Dali Temple and was granted “Dragon Taming Mace” by the former emperor. Therefore, he became the biggest threat to Empress Wu Zetian’s power. To eliminate this threat, Empress Wu assigns Yuchi Zhenjin to mass a group of sorcery masters, attempting to take the Mace from Detective Dee.